The Topcon OCT-2000 uses a high-speed light source and 12.3 megapixel color camera to document the back of your eye. This advanced testing is done in our office and takes less than 60 seconds per eye. Information captured with the OCT-2000 creates a 3D model of the scanned area providing detailed information normally invisible from view. This new technology helps us identify retinal health issues as early as possible and guides us in diagnosing and monitoring a variety of eye health issues including age-related macular degeneration, glaucoma and vitreous degenerations. The OCT-2000 also helps in evaluations of unexplained vision reduction and diabetic retinopathy. The Medmont E300 is a Corneal Topographer that uses Placido rings to map the surface of the human cornea. The 32 rings provides 9,600 measurement points and 102,000 analyse points resulting in a highly detailed map of the surface of the human cornea. This is used to assist in contact lens fitting, refractive surgery, orthokeratology and general assessment of the cornea. 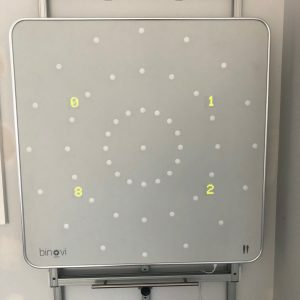 The Binovi Touch is the re-engineered Wayne Saccadic Fixator —used in Vision Therapy, an industry standard for over three decades, to measure and improve visual memory, reaction time and peripheral vision training. Ours is the first unit deployed in an Optometry practice in the world! The Visioffice system delivers more accurate spectacle lens fitting by giving us the most accurate measurements of your unique individual eyes. Visioffice measures eye rotation angles and eye dimensions so that your spectacle lenses are shaped and aligned to give you the best vision at all angles. This system also allows a different perspective of how different frames look on your face with a face capture and frame view feature. The iTerminal by ZEISS is the latest technology available at Abel Robson & Falkenstein Optometrists to ensure you get the most accurate and precise measurements for your glasses. By taking into account how your glasses fit you, the iTerminal allows for full individualisation of the lenses to suit your glasses and you.With over 160 years of ZEISS precision technology, and ZEISS Individual lenses now available at Abel Robson & Falkenstein Optometrists we ensure the clearest vision possible. Come and see the difference today!